Saying it, so Julia Gorin don’t have to. ISN SECURITY WATCH (22/12/04) - Serbian parliament has passed a law granting pensions to members of the Serbian Chetnik movement, the followers of the Serbian king who fled to London just before World War II. 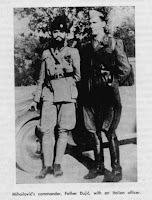 Bosnian born Chetnik commander Draza Mihajlovic revived the paramilitary units and their trademark long beards to fight the Nazis in World War II, but later changed sides to back the brutal Nazi occupation. The Chetniks’ primary enemies were the partizans, led by Josip Broz Tito, Yugoslavia’s communist leader until his death in the early 1980s. After partizans won the war in 1945, the Chetnik movement was declared criminal. Mihajlovic went into hiding for some time in Eastern Bosnia, but in 1946, the communists caught him and executed him as a war criminal. “Serbia must not enter 2005, when the world marks the 60th anniversary of the victory against Fascism ... with unpatriotic lies about General Mihajlovic," said the draft bill. "The greater part of Serbia was with Mihajlovic and supported him. A slur on the Serbia of 60 years ago is also a slur on the Serbia of today," it added. The current bill was initialized by groups that view Mihajlovic as a hero demonized by communist propaganda. Through relatives, many members of the Serbian government have ties to the Chetnik movement. Annually, the Chetnik movement gathers in Ravna Gora, Serbia to commemorate Mihajlovic. High-ranking Serbian officials are also traditionally in attendance, including Foreign Minister Vuk Draskovic and Prime Minister Vojislav Kostunica. The Socialist Party of Serbia (SPS) - the party founded by former Yugoslav leader Slobodan Milosevic - opposed granting the pensions. 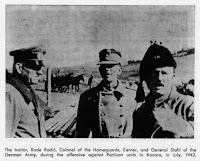 "One cannot deny that a significant part of the Chetnik movement collaborated with fascist Germany. To do so would be to rewrite history," media quoted SPS member Zoran Andjelkovic as saying. The Chetniks resurfaced once again in the 1990s during the wars that broke up Yugoslavia. Volunteers Serbs from Serbia, Bosnia, and Croatia joined Chetnik paramilitary units and fought against Bosniaks (Bosnian Muslims) and Croats in Croatia and Bosnia, committing some of the war’s most heinous crimes. During his recent visit to Bosnia, Serbian President Boris Tadic apologized to the Bosniaks and Croats for crimes committed by Serbs, but hastened to redeem the Chetniks but saying they were not fascists. Until only very recently, some Bosnian cities where Bosnian Serbs are the majority have had statutes of Mihajlovic on public display. Still, the offices of many Bosnian Serb officials are decorated with portraits of the Chetnik commander. Some refugee returnee organizations have accused the Chetnik movement of torturing Bosniak and Croat returnees to Republika Srpska, Bosnia’s Serb-dominated entity. Last month, Belgrade basketball player Milan Gurovic was banned from playing in Zagreb, Croatia after Croatian authorities threatened to arrest him because of a tattoo of Mihajlovic’s face on his arm. Authorities said they would allow him to play if he covered his tattoo, but Gurovic refused. and when Cetnici and Partizani won the nazi's Tito killed Draza and took the kings throne illegaly.We still dont know were the body is but there is Ravna Gora a monyment to Drazas bravery.NOT EVEN CROTIANS HAVE DEARED TO LIE THIS MUCH.Dont you know that people died?We never joined the nazi's a part of crotians did USTASE.We shoud bring you to law for this lie,Blogger is a google app. eather take this lies down or you'l be broth to law. Janko "half-man" or full time chetnik? Who was Draza Mihajlovic ? How much chetniks are paying to Julia Gorin? Julia Gorin say: All European are Nazi's !